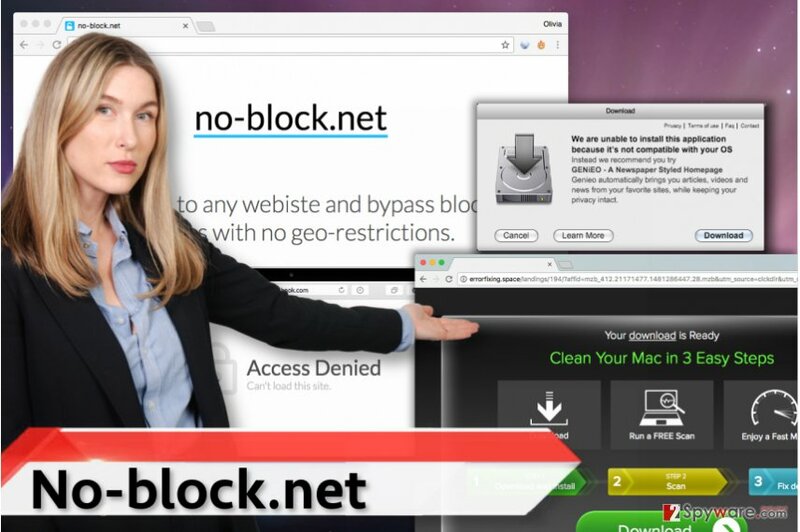 No-block.net is the PUP that uses misleading techniques to prevent removal. Use Reimage to locate malicious components and get rid of them faster than with uninstall instructions. A full system scan blocks virus reappearance and prevents traffic to malicious domains. No-block.net ads - are they dangerous? How did I install a program without even realizing it? No-block.net ads – are they dangerous? No-block.net virus is a clone of no-stops.net virus. This computer parasite alters browser’s settings and then starts displaying various third-party offers during user’s browsing sessions, sadly, annoyance might be the least problematic thing considering other issues that might arise from No-block.net ads. Although the program advertises itself as a proxy server that helps to access geo-restricted websites and blocked services, it is clear that the author of this tool had entirely different intentions when developing it. Instead of helping the user to access restricted websites, it simply bombards the user with third-party ads collected from various ad networks. It is advisable to refrain from exploring these offers because clicking on them can cause redirects to highly suspicious or even dangerous third-party sites. Once on such sites, you can be easily convinced to install a program you don’t need or sign up and provide personal information, and this can pose a threat to your privacy. Researcher demonstrates examples of No-block.net ads. If you are a security-minded PC user, better take actions to protect yourself from dangerous content online, and avoid clicking on eye-catching offers that pop-up on your screen out of thin air. Remember the good old rule – if it looks too good to be true, it is. Therefore, if you do not want to be lured into insecure third-party websites, better stay away from No-block.net ads and remove No-block.net components from your PC. For that, we highly recommend using anti-spyware software like Reimage. You can also try to fix affected browsers manually (please see No-block.net removal tutorial, which is given right below the article). You could get this ad-supported parasite either by installing a suspicious program or by following setup instructions provided on No-block.net website. No-block.net might come into your system in the form of a program or a browser extension, but it can come in like a fileless infection and simply alter your proxy settings without installing anything on your computer. We suggest you carefully inspect suggested settings when installing free programs because, with a help of software bundling method, free programs typically help various potentially unwanted programs to reach computer systems effectively. We suggest choosing Custom/Advanced settings in software installers, as this is the easiest way to notice and deselect suggestions to install third-party software, browser toolbars and other meaningless components that can add no value to your computer. If you were forced to change your proxy settings without realizing it, wait no longer and remove No-block.net virus using anti-malware software. We also prepared a manual No-block.net removal tutorial, which explains how you should eliminate it manually. Do not hesitate and contact us if you need any extra help when trying to remove No-block.net from your PC. Here, look for No-block.net or any other recently installed suspicious programs. Wait until you see Applications folder and look for No-block.net or any other suspicious programs on it. Now right click on every of such entries and select Move to Trash. Go to Internet options in Firefox. Open Connections tab, and then go to LAN settings. Deselect the Use automatic configuration script option. Click OK to save. If this doesn’t help to solve the problem, open Internet Options again, then go to Advanced tab and choose Reset. Confirm your choice. When in the new window, check Delete personal settings and select Reset again to complete No-block.net removal. Once these steps are finished, No-block.net should be removed from your Microsoft Edge browser. Open Firefox and type into its address bar: about:support. Select Refresh Firefox… from a panel on the right. Confirm your choice. Here, select No-block.net and other questionable plugins. Click Remove to delete these entries. Now you will see Reset Firefox to its default state message with Reset Firefox button. Click this button for several times and complete No-block.net removal. ^ What is a Proxy Server?. Webopedia. Online Tech Dictionary for IT Professionals. ^ Dann Albright. Which Websites Are Most Likely to Infect You with Malware?. akeUseOf. Your Guide in Modern Tech. ^ How to Keep Your Personal Information Secure. Federal Trade Commission. Bureau of Consumer Protection's Mandate is to Protect Consumers against Unfair, Deceptive, or Fraudulent Practices. ^ How to reset your Internet Explorer proxy settings. Microsoft Support pages. This entry was posted on 2017-03-03 at 06:16 and is filed under Adware, Viruses. You can quickly scan the QR code with your mobile device and have No-block.net ads manual removal instructions right in your pocket. How did you remove No-block.net ads?